We aren’t all that big on desserts around here. I think that may be because we live within 15 minutes of what has been called America’s best ice cream… the local artisan creations from Jeni’s. I have no problem loading the family into the car and making a trip there once or twice a week but recently we decided that needed to change some. We aren’t worried about our health or the size of our jeans. Rather we are trying to reduce the “dining out” portion of our monthly budget. Dagnabit! Since we can easily spend $30+ for each trip to Jeni’s we decided to get creative and make more dessert at home. The first way to accomplish this was pretty glaring. We can have Jeni’s at home by using the recipes in her book Jeni’s Splendid Ice Creams at Home. So once or twice a month we plan to make some of her delicious recipes. 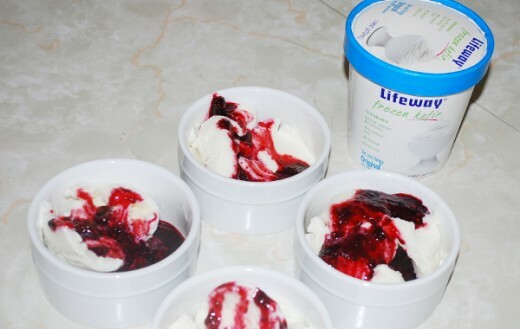 Secondly we want to make more frozen kefir and frozen yogurt. 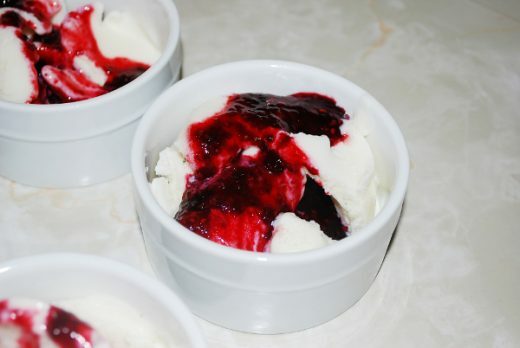 I have made my own frozen yogurt from homemade yogurt but I have yet to make my own frozen kefir. Sadly I let my kefir grains die over the summer and need to buy some more but when I passed some Lifeway Frozen Kefir at the market I decided to give it a whirl. We have tried two flavors now… original and strawberry. My 5 year old and I went to town on the strawberry and ate the whole container earlier this week. Don’t tell my other kids! I reserved the original for dessert tonight and spiced it up with some homemade blackberry compote. YUM!!! The blackberry compote was super easy. I just simmered a cup of blackberries with 3 Tablespoons of Thai Coconut Sugar and a couple tablespoons of water. When it was sufficiently reduced and thick I blended it up in the Vita-Mix and poured it over the kefir. The one pint size was perfect for me and my 3 kiddos (Dad works at night). Divide by four and serve. I can see us buying these more often in the future. At $1.24 per serving (family of four) it will definitely help us keep the budget in check. If any of my readers want to give it a try Lifeway has graciously given me a couple coupons for a free pint. Comment to let me know you want one and I will draw a winner at random next week. Good luck!